Sometimes I have to remind myself that God has everything under control. He’s permitting the difficulties. He’s shaping me. I don’t understand. I can’t see the big picture. Job didn’t know about the cosmic bet between Satan and God. All he could see was a completely unfair and incomprehensible situation. If you are going through tough times at Christmas, remember: they might be a gift from God. Of course, you wouldn’t want this kind of gift. But you’ll like the results when God has finished His product. So hang in here, don’t lose heart. Thank Jesus for the difficulties. Hail, Mary, highly favored of God! That’s how the angel greeted Mary in Luke 1:26. Though she was favored to carry in her womb the Son of God, she was also in for some bad trials — like the loss of her “normal” life and dreams for a perfect marriage with Joseph. Her son would be crucified in front of her eyes. Yeah, a lot of trials. But what I want to say here is that we are all favored of God. He loves us all. We all have a unique destiny. God has good things for us. For Christmas, just realize how special you are to God. You are a gift to Him! If you look at the backside, there’s a mess of loose threads, and you can’t make anything out. But if you look at the front side, the picture can be so astounding that you could understand why nobility paid a small fortune to hang them in their castles. 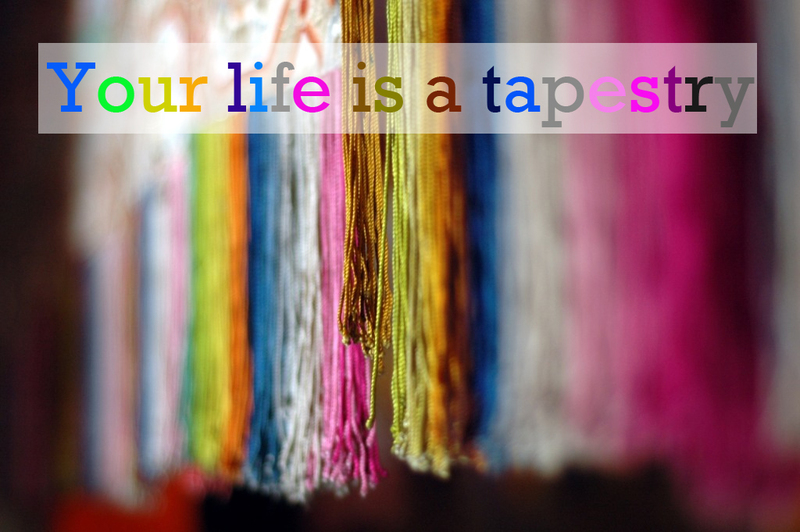 Many times, we’re on the backside of the tapestry. God is weaving, but we can’t make anything out. Not until many years later do we see the beauty emerge, when we get on the other side of the tapestry.